Antiquaires since 1970, siret: fr 24.430113233. Key high time, (xvie) in very good condition. 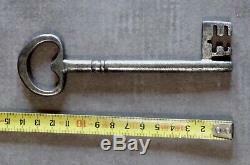 Beautiful wrought steel key of 14,5cm, ring in heart, solid stem with turned ring, panneton tied high, still Gothic, with open doors. Dimensions: 14,5cm x 4,5cm. Our warranty commits us as follows: we are not experts, but we refund 100%, without questions and with our apologies, any person disappointed by our shipment, within the reasonable period of 15 days. No risk for our customers! The sending of this object 5 for France, and 10 for Europe. 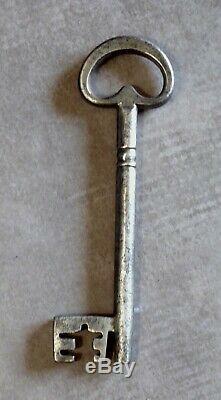 French Renaissance Key, 16thc, very good condition. 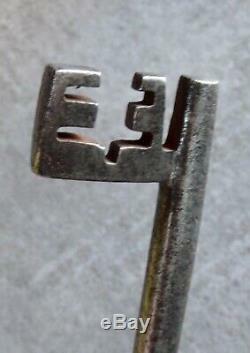 Beautiful forged steel key of 14,5cm, heart shaped ring, solid stem with turned ring, bitted high stick, still gothic, with open doors. French work, renaissance period, tel: 0665241111. 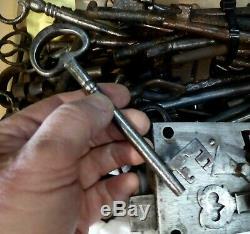 The item "key high time, (xvie) in very good condition, french renaissance key" is on sale since Thursday, March 28, 2019. It is in the category "art, antiquities \ objects of the nineteenth and before ". The seller is "dany46" and is located in Bellegarde. This item can be delivered anywhere in the world.